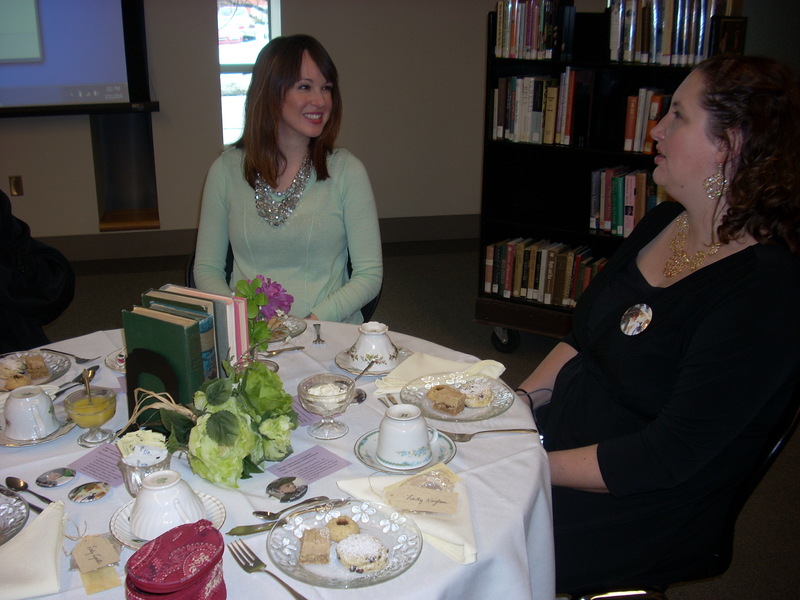 Daughter Mandy, my sister Lyn and I attend a free tea at our local library honoring Downton Abbey. As this is a blog that honors well-written stories, I’m taking the opportunity to mention one of my favorite filmed shows– Downton Abbey! Some of you are part of the craze that’s swept the English-speaking world that is Downton Abbey. If you are not a Downton Abbey fan yet, you should be! Downton Abbey is the name of the most-watched show in PBS’ history. It is based on the lives of an aristocratic family in England in the early 20th century, as well as the large staff that serves their daily needs. I like the show because the rich people are not snobs and care for their staff. No one is perfect but there are some characters I’m tweeting with on Twitter and learning more about them! 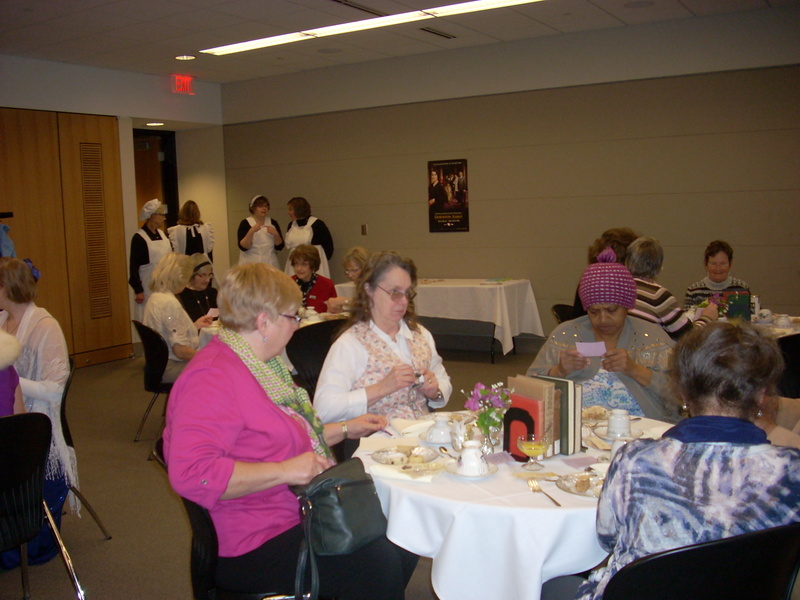 Attendees of the Downton Abbey tea were treated to hot tea in china cups and lemon curd. Downton Abbey is filmed in England in a gorgeous place called Highclere Castle. If you’ve not yet viewed this cultural phenomenon, I highly recommend watching it from the beginning of Season 1. Many libraries have DVDs and it has been on Netflix at times. The show has run for three seasons and is currently in the middle of Season 4. Mandy visits with a guest while sitting at elegantly dressed tables adorned with pretty china dishes. Recently, the Allen County Public Library in Ft Wayne Indiana geared up for the intense interest in the show with a free afternoon tea catered by Fort Wayne’s premier tea house, Sweet Violets Tea & Antiques (www.sweetvioletsteaandantiques.com). My sister Lyn, daughter Mandy and I gathered with other fans of the show to talk about the show’s intricate plot lines and relationships while partaking (that’s an English word, isn’t it?) of complimentary tea and pastries. We had tasty lemon curd, scones and tiny cakes. Delicious! Registration was required and space limited to 30 people. 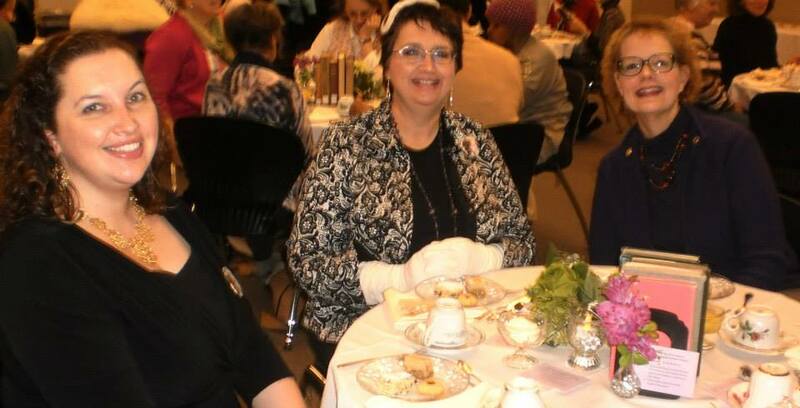 I dressed for the occasion in long gloves, white feathered headband and jewelry reflecting the time period. Other fans dressed full-scale in longish dresses and costumes. Cool! As a separate act, our local PBS station coordinated a free viewing of the first hour of Season 4 at The Embassy Theatre in early January. My husband, two grown daughters and I all attended and had a wonderful time! There was a huge turnout and it shows that people love to gather for good stories! OK, enough fawning about the show. Watch it and determine for yourself if it is worth the fuss. I’ll be surprised if you do not agree that it is one of the best mini-series to hit TV in a long time. If you’re a fan of the show, who is your fave character? What was your fave episode? Other appropriate comments are welcome. My husband and I are Downton fans, too. The tea looks as if it were lovely.